07-Jul-2007 -- On Friday, 06 July 2007 we travelled from Walvis Bay to Windhoek and then on to Rehoboth, where we camped for the night at the Oanob Dam. The following morning we followed the D1237 northwards until we reached the gate to the farm Duruchaus which is very close to the Oanob river. We then followed the farm roads in a northerly direction, passing through many gates and crossing the farms Geelkop and Uitval. There were frequent forks in the road and at times we had to stop and ask directions. Eventually we arrived at Nineis North where we met Rosa van Wyk, one of the co-owners of the farm. I had phoned her previously to request permission to visit this Confluence which appeared to be situated on the side of a mountain on this farm. She gave us permission but suggested that we get the permission of another co-owner, Mr Niels van Wyk, who lives a short distance away. We drove to the house and after explaining the purpose of our visit, he was happy to give his consent as well. We then followed one of the farm roads which took us to within 2.7 km of the Confluence. After a quick lunch we set off to walk to the Confluence at about 14h00. 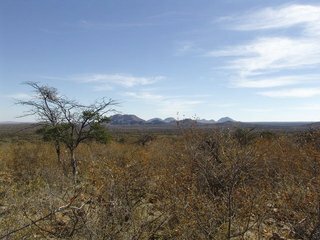 At first it was an easy walk through the trees and bushes, but as we progressed, the going became increasingly difficult as the density of the acacia thorn bush increased. We all sustained multiple scratches as we got caught on the small, curved twin thorns on these bushes. As a result, we made very slow progress. We slowly climbed up the gully between the mountain and a small adjacent hill where a large troop of baboons began barking at us. We crossed this ridge, only to find another, steeper gorge on the the side. The Confluence was situated on the northern side of this gorge at an altitude of 1894 m.
By the time we had taken our photographs, the sun was setting. As we climbed slowly down the gorge, we realized that we could not return the way we had come in the dark, due to the thorn bushes. We therefore cotinued downwards and decided to take the longer route back by going around the small hill. By this time it was dark and we had no torch, but we soon discovered that we could manage by using the light from the GPS. Our progress was very slow as at times the thorn bushes were too dense to get through and we would have to deviate from our course. On one occasion a large scorpion crossed our path. Fortunately we could locate our vehicle in the dark back-tracking our course on the GPS. It was a very welcome sight, as we had been walking for about two hours in the dark. By the time we got back to our campsite it was about 10 p.m.